♚ SOUFEEL was founded in 2009. Since then, we have had the motto "For Every Memorable Day". Soufeel focuses on the need of the unique you, offering you the most beautiful charms, beads, bracelets, necklaces and other accessories. ♚ SOUFEEL has more than 10 multinational well-known designers whose design experience is over 15 years in average. They have unlimited inspiration in their minds. The design is special and delicate, which suits different occasions and personalities. ♚ SOUFEEL products adopt 925 sterling silver, rose gold, Swarovski, and colored gems as main materials. 100% safe for sensitive skin. ♚ SOUFEEL has a variety of designs of charms to meet your emotional need. The lucky charms will record every touched moment of your life. ♚ Featured here is a cute and sweet bracelet with beautiful charms. Both the bracelet and charms are made of 925 sterling silver. It's designed for birthday theme. You could see a "happy birthday" bead, a strawberry cake bead, and also we have an October birthstone charm on it. Looking for something special as a birthday gift? This bracelet must be a considerable choice. ♚ Soufeel basic bracelet is compatible to most charm beads. 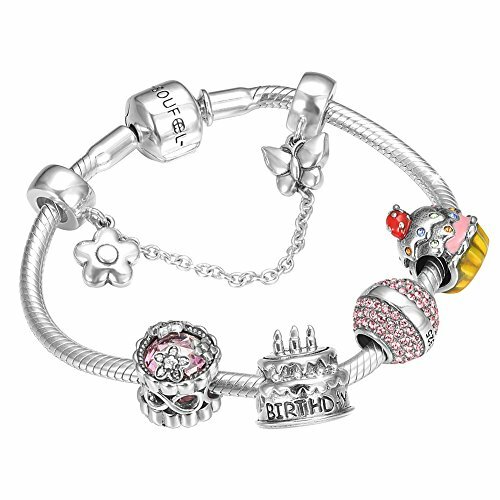 You could easily add charms you like to wear bracelets with different styles. The clasp has a super strong closure that will stay closed to keep your charms nice and safe. ♚ The length of the bracelet is 23cm(9.1in). SOUFEEL suggests correct bracelet size = Your wrist size + 1 cm/1.5 cm. ♚ The product is made of 100% 925 sterling silver and swarovski crystals, exquisitely carved by top-level craftsmen. Every SOUFEEL product has passed SGS Quality Certification. 100% safe for sensitive skin. ♚ Please don't hesitate to contact us whenever you have any concern about this item. It will be our pleasure to give you a wonderful shopping experience. If you have any questions about this product by SOUFEEL, contact us by completing and submitting the form below. If you are looking for a specif part number, please include it with your message.